Pollen is a protein-rich powdery substance produced by many plants, and it's more important for the ecosystem than serving as a reason to wash your car in the spring. Bugs who visit flowers might be seeking the sugary nectar inside, or they could be eating the pollen to help enrich their diets. Bees are well-known for their codependent relationship with flowers. Bees land on a flower, get coated with pollen, then shed some of the pollen on the next flower to help plants reproduce. Flowers, in return, provide bees with nectar and pollen to take back to the hive. The bees you see flitting between flowers aren't eating the pollen; most eat nectar, but they take a mixture of pollen and nectar back to the hive to feed to developing larvae. Wasps typically feed their young other insects, but adult wasps drink nectar occasionally -- if you see them on a flower, they might be helping pollinate it, but they aren't eating the pollen. A few species of flies, such as the drone fly that looks similar to a bee, eat pollen every now and then, but it's not typically a diet staple. Most land on flowers to drink nectar instead. Several types of beetles enjoy the protein punch they receive from eating pollen. Ladybugs, seen commonly across the United States, eat pollen often, although they prefer other insects such as aphids. Another example is the pollen beetle, a small bluish-black beetle that can arrive in flower fields in such high numbers that they decimate the plants by eating so much pollen they can't reproduce. Some mites find pollen to be a tasty treat. Pollen mites, especially, go to great lengths for a meal. These tiny bugs climb onto the back of pollinators such as bees and ride along, snagging pollen as they travel. They can actually be big bee pests, though, because some continue riding all the way back to the hive where they dig into pollen stored to feed the bee larvae. Butterflies serve as powerful pollinators for day-blooming flowers, while moths perform the same service for night bloomers, so it seems to make sense they would also eat pollen. They don't, however. These insects drink the sweet nectar from many flower varieties, spreading pollen as they move from plant to plant. 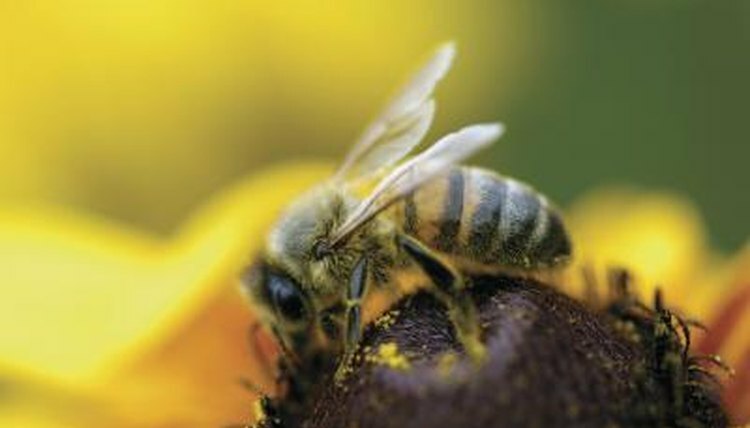 The pollen sticks to their legs and bellies and drop at the next plant, helping pollinate without the insects eating or gathering the pollen for consumption.